Happy Birthday to Sunday baby #2 – Trees & Flowers & Birds! This post is a day late but the time got away from me yesterday. 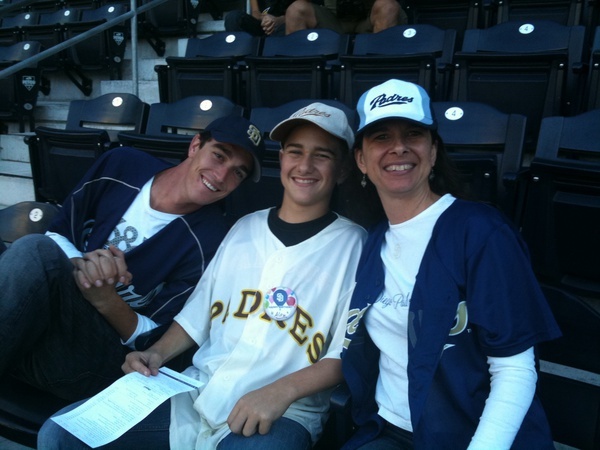 I wrote this as a post to the August moms list before we left for the Padres game yesterday so excuse that some of the timing references are off. Photos from the game at the bottom despite me forgetting the good camera. Somehow, my always smiling boy has remained that way as he enters his second year of the dreaded teens. No real attitude, no grunts or bad moods. He still wakes up smiling and remains that way as long he’s had sufficient sleep. He still happily tags along with me to workout or hike or go to baseball games (we are going tonight as it’s most likely the last night he can go as freshman football starts in full swing tomorrow). He still utterly adores his big brother and laps up time with him – which MusicMan is thankfully quite happy to give. His first choice of ways to pass the time is via video games. Preferably his PS 3 gaming system at his dad’s though he will slum it here with me on the PC playing World of Warcraft (where he is currently). He’s thrilled to be starting football tomorrow. He had to check in today for a first team meeting & to be issued equipment and…wait for it…a LOCKER! He doesn’t have to cart his equipmen t back & forth anymore! Sweet 🙂 I like this high school thing much better already! Talking to him has become more and more enjoyable. He has the best of both worlds – conservatives at his dad’s and my pinko commie liberal home here 🙂 After this summer in Sweden, I can tell that he really paid attention to what goes on politically & socially there too. I love that he is exposed to something more than our system. It’s so fun to see their minds open up beyond their worlds! He still doesn’t read as much as I’d like though. He is the boy with a 1000 questions. So many times I finally end up saying – “Google it!” just to stop the barrage 😉 He’s talking a good game so far about really understanding how he has to apply himself & work hard now that he’s in 9th grade. We got the football practice schedule & there is not one single day of the week that will end before 6pm for him. That’s not a lot of time for homework! But, his weekends are completely free other than time he wants to spend working for the Pop Warner league as a security during their games to earn some money so I imagine there will be a lot of catching up or, hopefully, working ahead on those days. He has a great sense of humor. No sensitivities like his brother at all. Socially he’s not super popular, but he really doesn’t give a hoot! He makes friends easily and has a few very close ones who we’ve known for years. He’s quite happy treading the fine line as a self-identified geek with athletic prowess. The thinking man’s jock 🙂 His attitude about being one of the smaller kids in the freshman class is perfect. He’s going to show the coaches that he can work harder than anyone, knows more about the game than anyone, and has the biggest heart (which he does – mommy brag) He did grow about an inch this summer and more importantly – his feet are still growing. He’s close to 5’2″ now and 115 lbs. Still no SURE signs of puberty. Voice hasn’t changed. Just a hint of hair in random places, but he’s certainly filling out. Oh, and he can be quite the space cadet! Head in the clouds moments without a grain of common sense that sti ll floor me. One of the reasons I’ve been slower to give him the freedoms I gave his brother at this age. 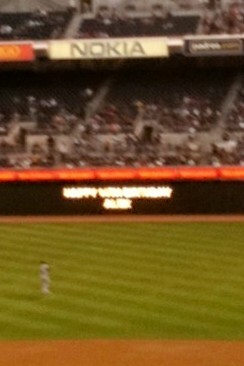 I swear that the blurry text reads "Happy 14th Birthday Alex"
This good looking crew got on the big screen between innings 4 times! Books 33 & 34 – back in the saddle again!